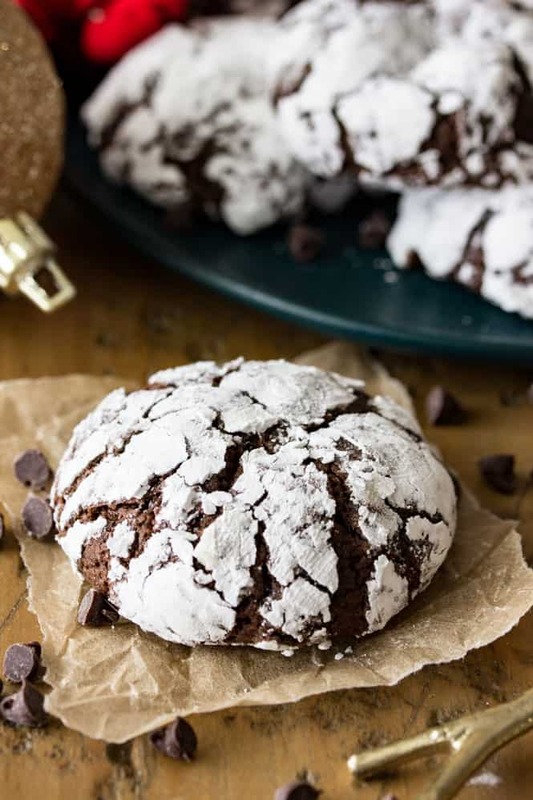 These Crinkle Cookies are one of my favorite holiday treats. Richly chocolaty and fudgy they remind me a little bit of a super soft brownies that have been rolled in powdered sugar! 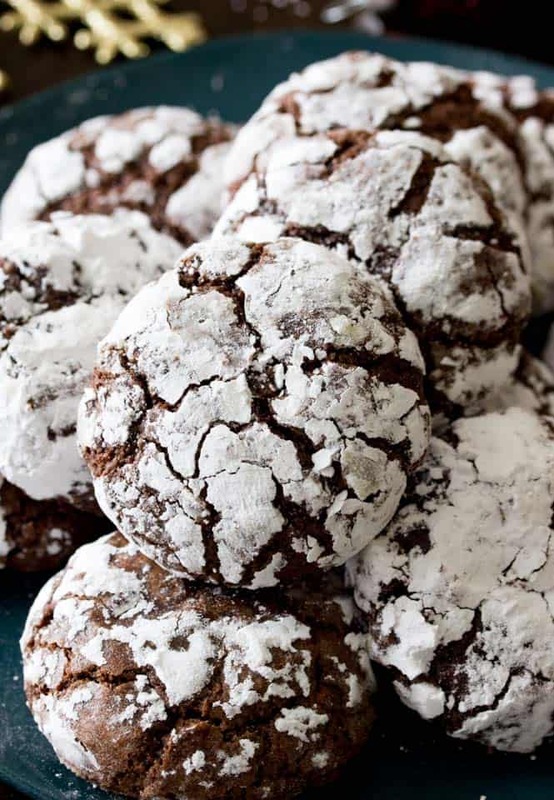 I originally shared these Chocolate Crinkle Cookies over on Spend with Pennies! We’re going to jump right in to these Crinkle Cookies in a minute, but first, have I told you guys about my “Baker’s Club” yet? A little while ago I started a Facebook group specifically for those of you who followed the blog and enjoyed baking. It’s still pretty new and small, but I think it’s a great place for people to ask any baking related questions they might have and to share pictures of their baked goods. I’d love it if you joined in, asked any questions, shared any advice, and especially if you’d share your baking pictures! Successes and failures welcome (I know I have plenty of the latter), and they don’t just have to be from my website, of course! 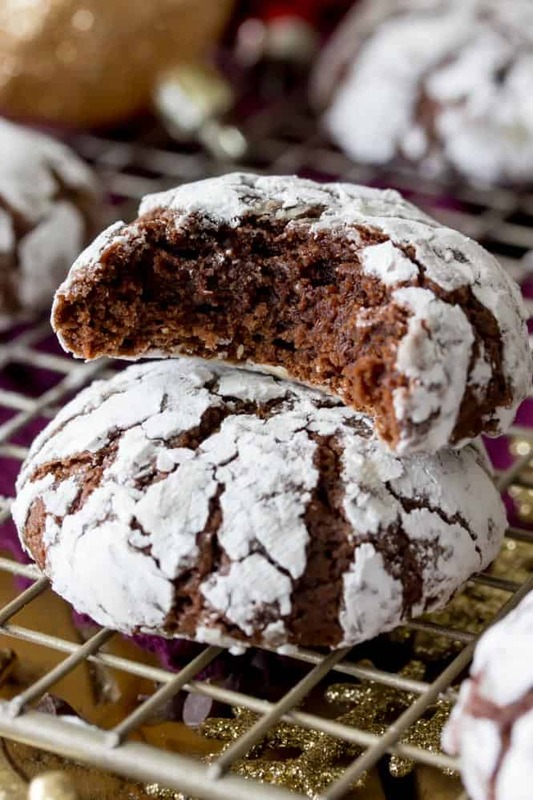 Ok, but now let’s get back to these beautiful sugar coated Crinkle Cookies, shall we? 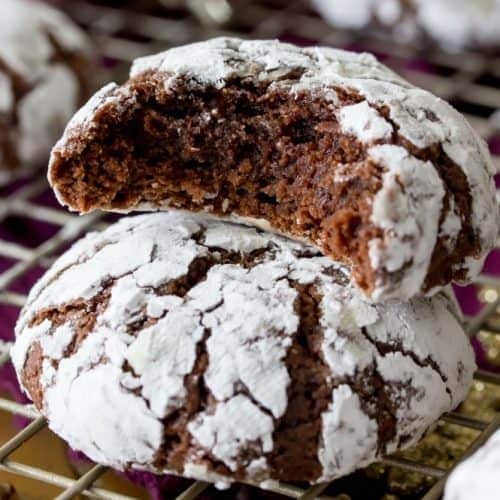 These cookies are a classic cookie recipe and they are sometimes also called Snowcaps (I just learned this, I always thought “Snowcaps” were just nonpareil-covered chocolates) for their powdered sugar coating (which resembles snow, of course!). These cookies have an amazingly soft, melt-in-your-mouth texture, and to make them as soft and fudgy as possible I substitute some of the white sugar for brown sugar for chewier and more richly flavored cookies. I also add mini chocolate chips into the batter… they’re optional but highly recommended because I really believe you can never have enough chocolate. The end result is cookies that remind me of brownies, only softer and slightly less dense. And covered in powdered sugar, of course. These cookies aren’t difficult to make, but they do take some patience! The crinkle cookie dough will need to chill for several hours before it can be rolled and baked; this will keep your cookies from spreading too much and will also make the dough easier to roll. This dough still tends to be a bit sticky (you’ll definitely get your hands dirty! ), but the chilling makes it possible to roll the dough into neat little balls. 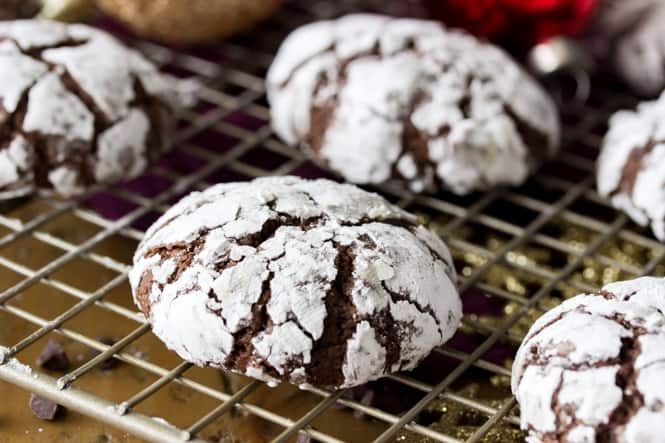 Don’t be shy with the powdered sugar — use as much as needed to evenly coat your cookies. I actually like to roll them in sugar, then wash and dry my hands (to get rid of all of the chocolate from the dough!) and then roll the sugared dough in my hands, pressing it into the dough and then re-rolling in sugar if needed. This helps my cookies stay well-coated in sugar after baking. Enjoy, and if you make them I hope you’ll share a photo on my Baker’s Club Facebook page!! After chilling, preheat oven to 350F (175C). Transfer to baking sheet and bake on 350F (175C) for 12 minutes. I made these cookies today and they are absolutely delicious! A little crisp on outside and very soft and fudgy on inside! Perfect! I’m hoping to stop eating them because it was my intention to add them to cookie trays and give as gifts! Thanks for the recipe, Sam! How should these be stored if made ahead of time? Store in an airtight container at room temperature once they have cooled completely. I hope you love them!